My secret sister sent me two blocks from a shop hop of 2012. I opened them both today and realized they were both the same. I like that! I can come up with some cool things to do with them. The instructions aren’t really instructions. More like guidelines. I like this. It means I can do what I want as I assemble it. 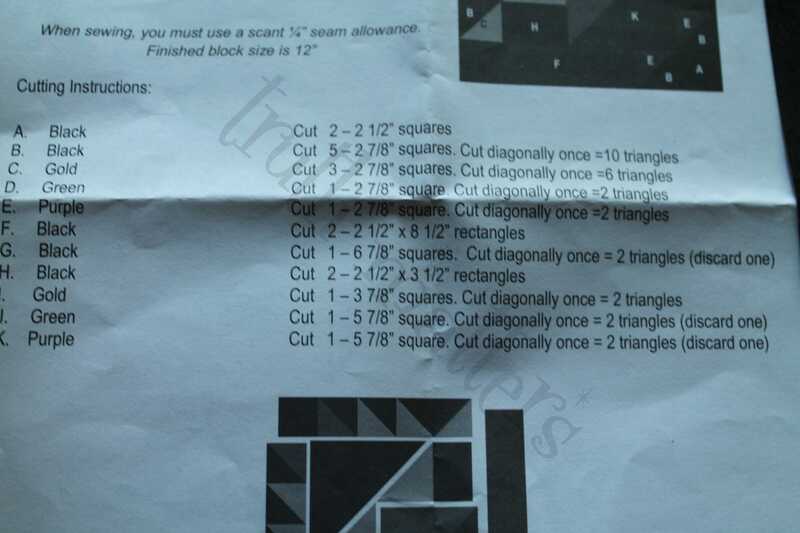 It says to cut all the pieces and then sub cut them into triangles. I’m not going to do that. 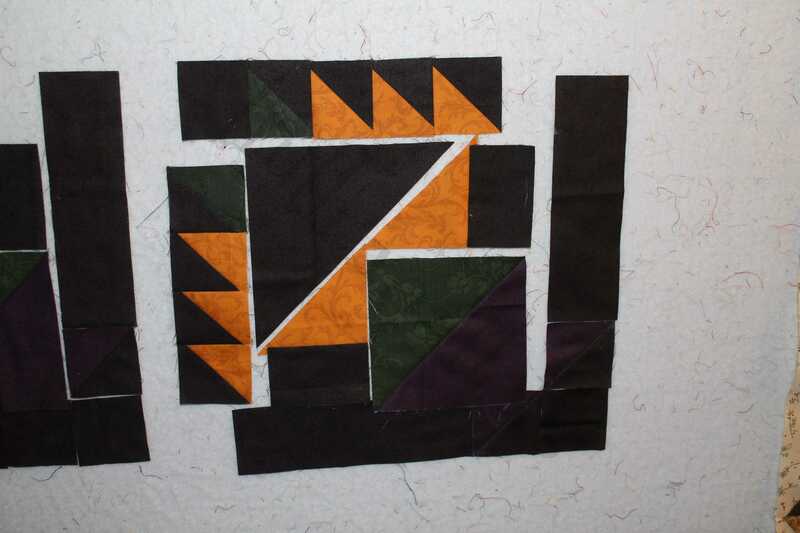 I’m going to leave them as they are originally cut and do the HSTs my fast way (most everyone’s fast way, actually). I do not have the yardage readily available. It was precut into small scraps before packaged. The following is the cutting guide. 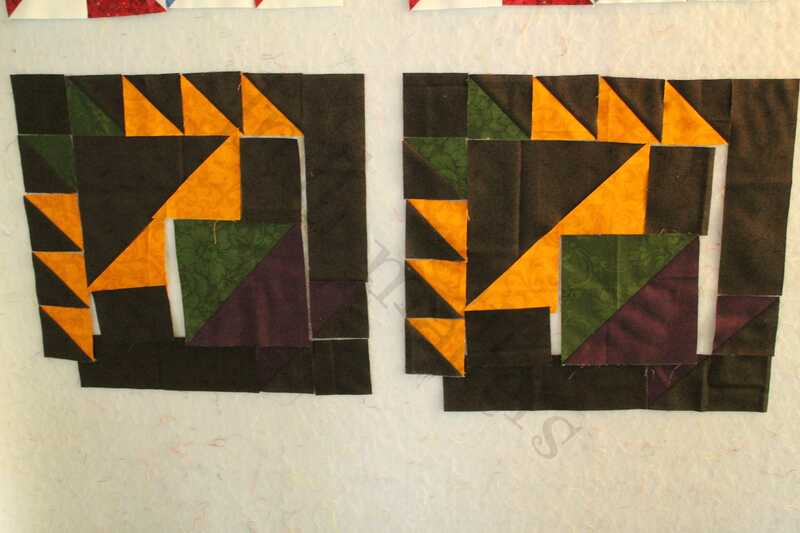 Draw a diagonal line on all Gold, Green and Purple 2 7/8″ x 2 7/8″ pieces. 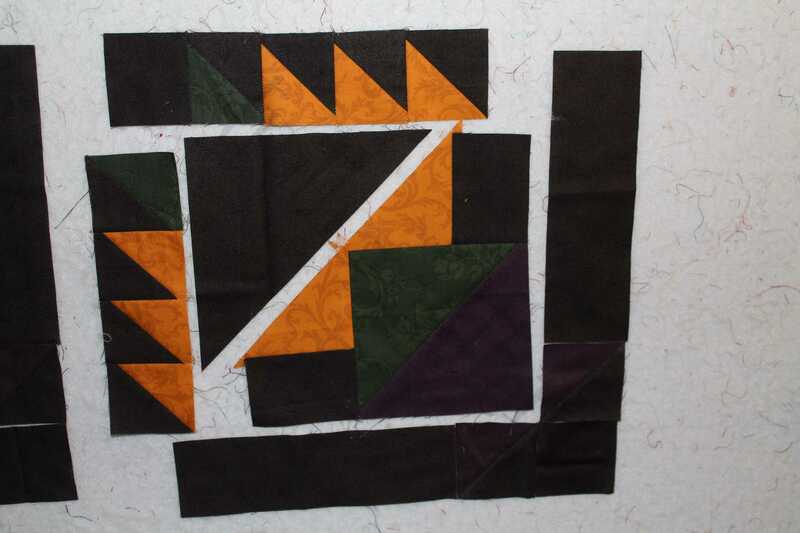 Draw a diagonal line on (1) Green 5 7/8″ x 5 7/8″. Cut on the diagonal (1) Gold 3 7/8″ x 3 7/8″. Cut on the diagonal (1) Black 6 7/8″ x 6 7/8″. Discard one half/save for another project. 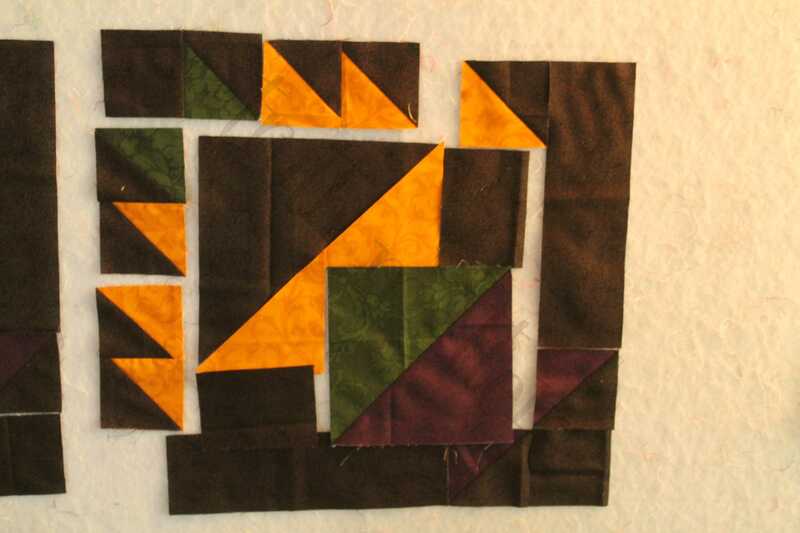 Using (5) Black and all Gold, Green and Purple 2 7/8″ x 2 7/8″, create HSTs. 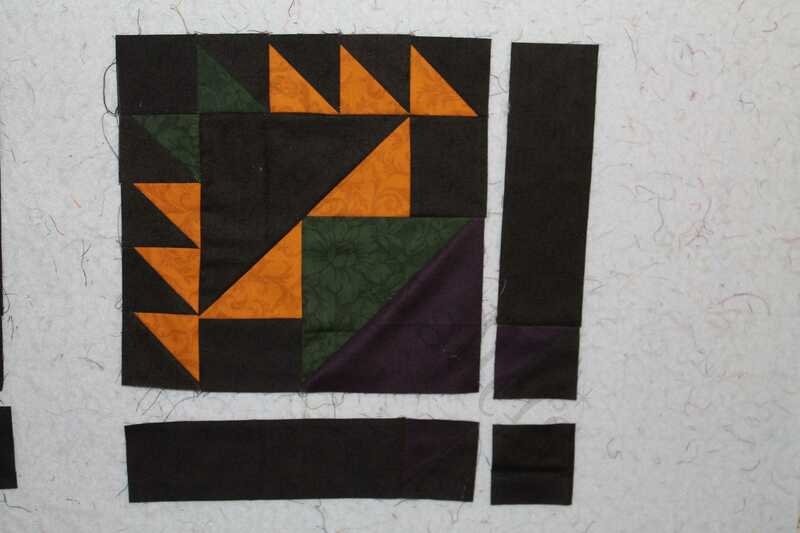 Create by sewing on both side of the drawn diagonal line. Cut on line drawn, iron flat, trim to 2 1/2″ x 2 1/2″. 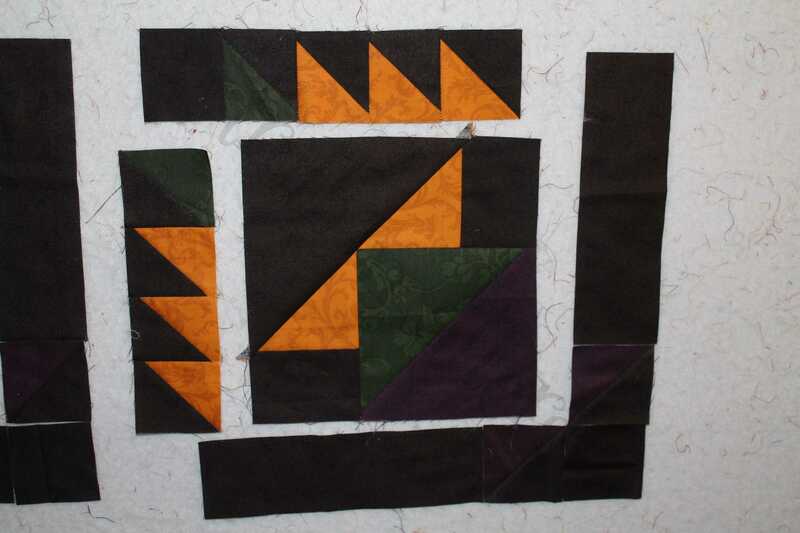 Total: (10) HSTs ((6) Gold, (2) Green), (2) Purple) when finished. 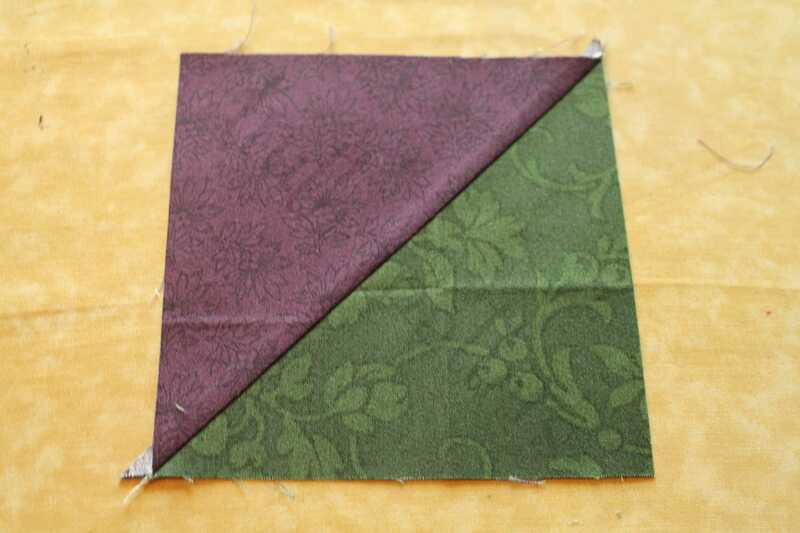 Using (1) Purple 3 7/8″ x 3 7/8″ and (1) Green 3 7/8″ x 3 7/8″, create a larger HST. My method creates two – set the other aside for any other project you wish to use these colors in – the second one will not be used here. This is how it will look set up on your design wall after creating the above HSTs. 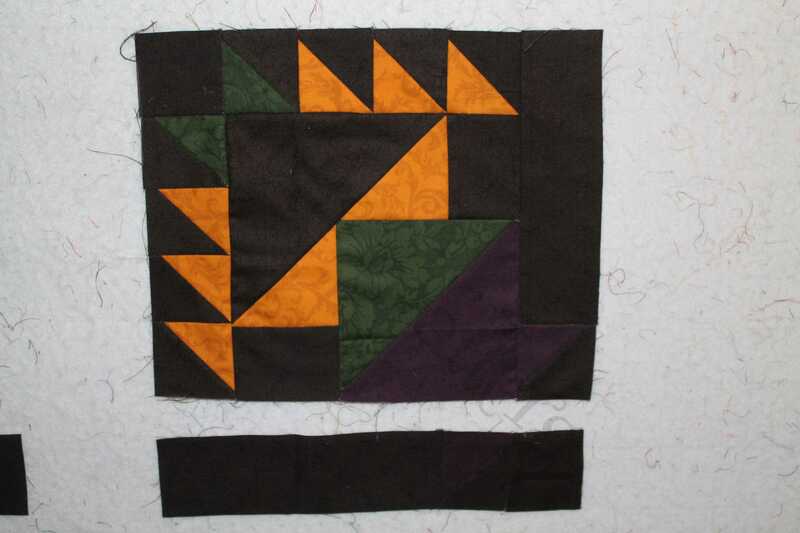 The bottom right corner is hard to see but the Purple/Black 2 1/2″ x 2 1/2″ HSTs have the purple facing the center and the black out. The top left corner and the bottom right corner are the(2) Black 2 1/2″ x 2 1/2″ pieces. Assemble. I just started putting little pieces together and built it up from there. 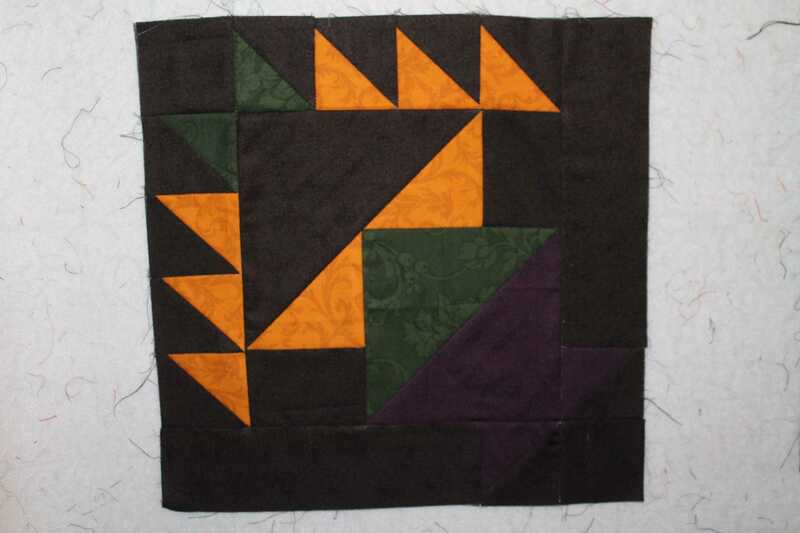 The Gold triangles cut in the beginning are attached to the (2) Black 2 1/2″ x 3 1/2″ pieces before being attached to the top and side of the Purple/Green 3 1/2″ x 3 1/2″ square. 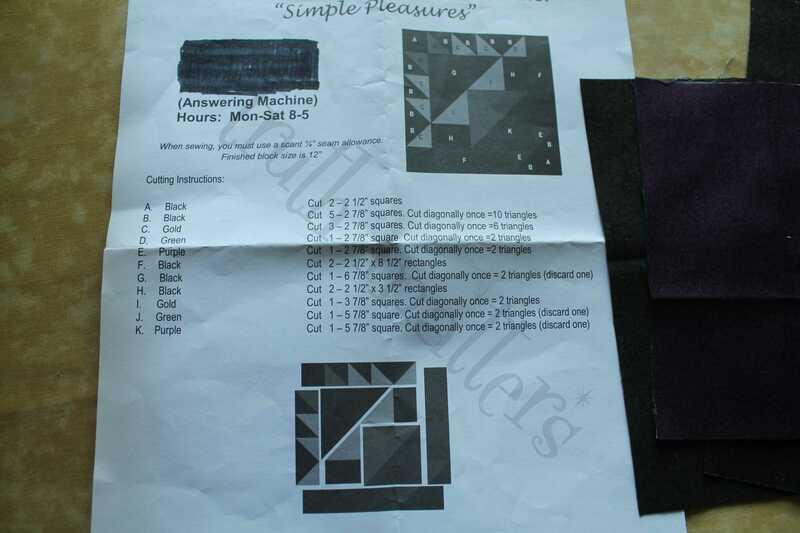 The side and bottom are the (2) Black 2 1/2″ x 8 1/2″ rectangles attached to (2) Purple/Black 2 1/2″ x 2 1/2″ HSTs. One more line to go! Done! I love this little block! I can see doing this pattern with lots of different color combinations. 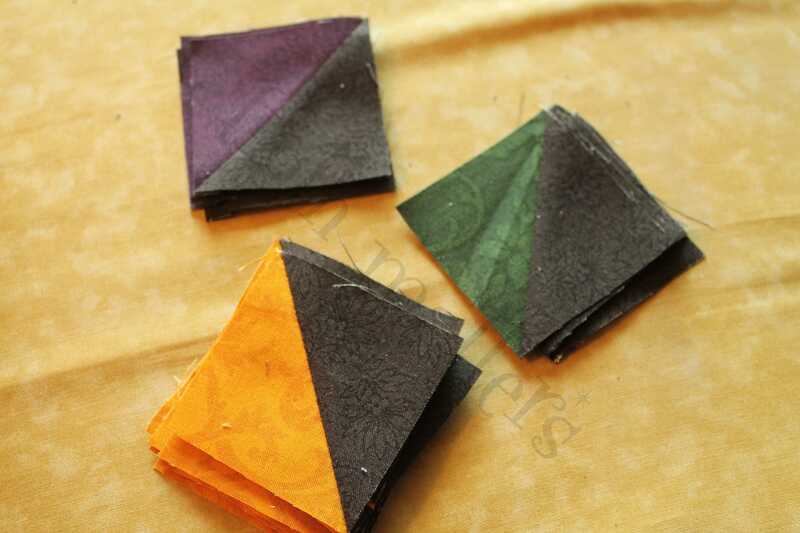 Being as the pieces aren’t really big, scraps would be excellent with this! 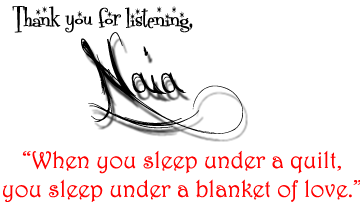 Thank you for the blocks and the pattern, Secret Sister!